Add some personality to your bath or kitchen with a gorgeous backsplash! Besides being pleasing to look at, this type of wall tile has a number of practical benefits. It protects your walls by being a shield from spills, splashing water and even splattering food. This tile is also easy to clean by simply wiping it down with cleaning fluid. Choose from backsplashes that are made of a variety of materials and colors to perfectly suit your kitchen. Stylish and functional, these backsplashes allow you to create a distinctive look to compliment your kitchen! Backsplashes are a great way to get creative with your kitchen design. If you want to make a fun bold statement without going overboard and ending up with a gaudy look, backsplashes are the perfect area to add a little pizzazz to your kitchen! Since backsplashes do not cover a large area, a splash of color or fun texture will add a striking feature or focal point of the kitchen, rather than taking away from the other parts of the kitchen. Plus, if you’ve got neutral colors (from the brown, gray, and white families) throughout the rest of the kitchen, backsplashes are the perfect way to break it up and add a gorgeous pop of an accent color! You can try mixing and matching different types of tile to give the walls color, texture, depth, and lots of style. Add medallions and metal accents to bring detail into your backsplash design, and play with different types to create interesting patterns that incorporate multiple materials. Have fun mixing and matching tiles to customize your backsplash, and create the perfect look for your kitchen! Backsplashes are also a great way to tie together all of the other main elements and colors in your kitchen such as the countertops, cabinets, and floors. At Flooring Creations we typically recommend selecting your backsplash after you’ve chosen (or already have) your cabinets, countertops, and floors. Or if you’re selecting all or even some of the main elements of your kitchen around the same time as your backsplash, you can get samples of each element and lay them out next to each other in order to get a better idea of how they look when put all together and installed. If you already have your countertops, cabinets and floors installed in your kitchen and all you’re looking for is a backsplash, bringing samples from those already installed elements in your kitchen such as a drawer from your cabinets, a piece of flooring material (if you have any extra pieces that aren’t installed), and a paint chip of your kitchen wall color if you’re absolutely set on that color, into Flooring Creations where our decor consultants can help you see how different backsplashes will look with your kitchen. Or, if you’re unable to bring in elements from your kitchen, taking pictures of each element is helpful as well. This makes it possible for us at Flooring Creations to help you put together a harmonious color scheme that makes your kitchen look like it was decorated by an expert! Mosaic backsplashes are small (12”x12” mesh sheet), glazed glass, stone, metal, or tile pieces organized in a design or pattern that are often backed with mesh, which allows installers to mount larger areas at a time, and lay them out more precisely. In the past, the most popular mosaic material has been the glazed ceramic 1 x 1 tile arranged in a geometric repeating pattern. More recently however, mosaics are broadening to include combinations of different materials, uniquely shaped tiles, gorgeous designs and textures, and can even look like modern art. Ceramic and porcelain tiles are very similar when it comes to tile features and care, but the main difference lies in their construction. Ceramic is made from clay while porcelain is made from pressed porcelain dust which makes it harder, more dense, and durable. These tiles have remained a popular choice as kitchen backsplashes for a variety of reasons. For one, compared to other methods they are relatively inexpensive, somewhat easy to install, and if you buy glazed or nonporous tiles they can be cleaned with ease. Ceramic and porcelain tiles are available in a variety of colors, sizes, shapes, textures, and they can be plain, patterned, or themed. You also have the choice of selecting either One of the most popular backsplash tile are the always classic subway tiles. Glass is definitely raising in popularity as a backsplash material due to its luminescent, marble-like texture that is both surprisingly strong and beautiful. Glass tile is a breeze to clean, it’s more hygienic, scratch resistant, and available in a smooth or textured format. A glass backsplash has a more modern look that can provide the perfect finishing touch to any kitchen. Plus, the shine reflected by glass tile can make your room feel more open and airy with light bouncing around the enchanting kitchen you’ve designed. Natural stone tile backsplashes will never go out of style. Most natural stone backplashes are made of popular natural stones such as travertine, marble, and slate. They typically have neutral and natural shades of browns and grays, and can easily be matched to an existing kitchen design. It features naturally unique textures and varying color patterns that add visual interest. A natural stone backsplash will look great alongside granite countertops, but you can also create contrast by placing it next to a wood-look or ceramic tile countertop. A natural stone backsplash will be long-lasting, but you’ll want to stay on top of maintenance. 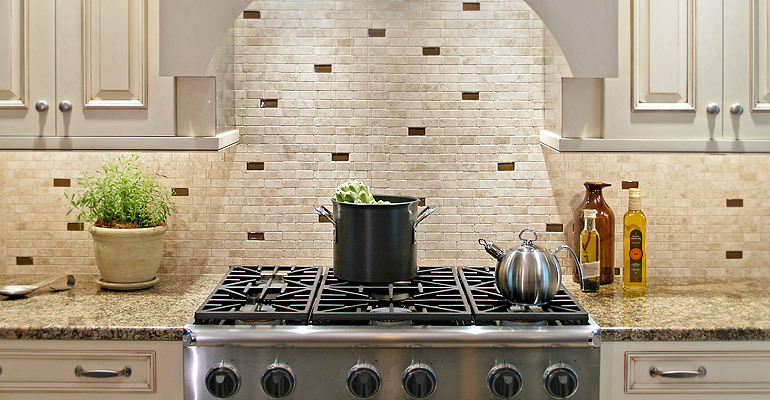 The options for your backsplash kitchen tile and mosaics are endless! If you’re unsure of where to start or what would look best in your kitchen, we encourage you to stop by Flooring Creations and speak with one of our knowledgeable design consultants that can work with you find the perfect backsplash to enhance the aesthetics of your kitchen by finding a backsplash that compliments the other elements in your kitchen such as the countertops and cabinets, which will tie all of the elements in your kitchen together, giving it that professionally decorated look! Our primary goal is to provide the best customer service and a shopping experience that’s worth recommending to your friends, as we strive to help you, and not just sell to you.